If there is any merit to the advice often given to aspiring authors, “Write about what you know,” then A. Hardy Roper would be the person you’d choose to write novels set in Galveston, Texas. His great-grandparents emigrated from Germany in the 1840’s entering the U.S. at the Port of Galveston. He is a fourth generation Galvestonian. 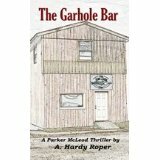 With two novels, Assassination in Galveston and The Garhole Bar, to his credits, Roper has displayed his skill at telling a story that keeps the reader entertained. My personal favorite is The Garhole Bar, admittedly because I love the title. Every time I am in the Galveston area, I expect to turn onto a street, close to the waters of the Gulf, and see a run-down, but inviting building. The book’s title scrawled above the door, it invites adventurous customers to enter and explore the mysteries. Parker McLeod is the protagonist for both Roper’s novels. A well-trained, former military man, McLeod runs his bar as he and his friends are pulled into mysterious and puzzling plots of criminals and their misdeeds. The author does a great job of making McLeod a believable and interesting character; revealing his flaws as well as his strengths. For readers who enjoy following a main character through more than a single, well-written novel, these books will be just what you are looking for. 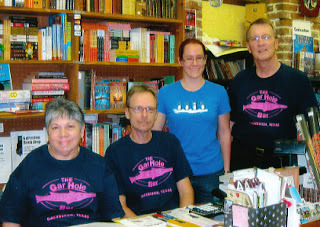 Roper recently dropped by the Galveston Bookshop, where the staff donned his Garhole Bar t-shirts for the photo on the left. It’s time for a third in the Parker McLeod series and we hope the author obliges soon. 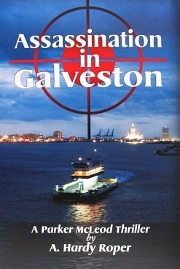 Roper has written a screenplay for his second work, Assassination in Galveston. He publishes his work through WESTBAY Publishing. Purchase his books, review the screenplay and learn more at http://www.assassinationingalveston.com. Don’t forget to sign up (upper right) to receive e-mail notifications when this blog is updated. Heck, because of his popularity, The Garhole Bar might work as a real place. Of course, he'd have to stop writing and push drinking instead of reading.